Underutilized actor Nick Stahl, best known from his role as an earthy super-powered prophet in HBO's Carnivale, continues his streak of flimsy direct-to-video appearances with On the Inside, an institutional drama-thriller from Haunting in Connecticut director D.W. Brown. Here, Stahl plays a college art professor, Allen, who's recently been arrested and jailed for murdering the man that raped his girlfriend, only he's been funneled into Northwood psychiatric ward -- among murderers, rapists, and other deranged pariahs -- for evaluation of his mental state. Out of the starting gate, the film puts its audience on analytical high-alert; submerged in the grounds of a mental institution and interacting with eccentric outsiders, it leaves one wondering whether we're absorbing the real or surreal, whether Allen offers a reliable point-of-view or not, and what Brown's trying to tell us about human nature. To the film's disadvantage, On the Inside leaves one scratching their heads beyond the end credits over its provocative questions, culminating in a fruitless and disconcerting suspenseful exercise that meanders in both literal and abstract arenas. Certain elements hint at something under the surface of On the Inside, but Brown's direction makes it unclear whether it's all an intended effect or a symptom of tongue-tied storytelling. Allen engages in several bizarre, contrived conversations once he enters the facility: he amicably chats up a twitchy-eyed, unsettling creep (Ben Marshall) with a thing against women due to a "glandular problem", as well as a fury-driven lunatic (Dash Mihok) who's ready to stab anyone who looks at him wrong. This banter, from skin-crawling peculiarity to alarming ferocity, goes about as expected in relation to the characters' types; yet, there's an undeniable strangeness present that'll get some pondering the authenticity of what's going on. It doesn't help that the staff around the hospital aren't acting normally, from a popular guard (Tariq Trotter, aka Black Thought from The Roots) recently back from a mysterious vacation to the experimental drug-happy warden (a wrongly-used, off-game Shohreh Aghdashloo) who videotapes interviews with the inmates. Couple that with flashbacks to Allen's past, and you've got something peculiar going down in Northwood. This type of film's effectiveness, where the viewer explores someone that's surrounded by mental convolution, pivots on how personally the audience knows the main character, an area where On the Inside falters early on. 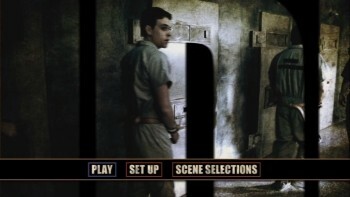 Director Brown gives us little time to understand Allen before throwing him in the fray; after a quick flash that reveals the lead-up to his wrongdoing, and the "justification" behind his actions, the film transitions to his stint in the mental institution with hardly any character foundation or a grasp on how unstable he may or may not be. We're left grasping in the dark about Allen's integrity, all the way to a point where he's moved to a minimum security portion of the hospital, where he's allowed to interact one-on-one with Mia (Olivia Wilde), a beautiful but troubled girl with bipolar disorder. It's unclear whether Allen's relative nobility makes him trustworthy or a psychopath pulling the wool over the off-kilter institution's eyes, and while some could argue that it's a basis for interpretation, the set-up doesn't offer a sturdy anchor in how to perceive his temperament. Allen's exaggerated and volatile flashbacks to childhood aren't enough to supplant this. On the Inside originated as the germ of a dialogue-driven stage play that later blossomed into a feature-length film, and I believe it could've provided its dark and zany perspective more clearly in the former venue. Director Brown knows how to imbue his actors with persuasive dramatic vigor; he crafts haunted, lost expressions of weathered psyches in Nick Stahl and Olivia Wilde that intensify as Allen and Mia interact more intimately, while the eccentric psychosis of the other high-security inmates achieve their intended discomforting presences, a mix of unpredictable violence and repulsiveness. Yet, the way it's realized feels like a muddled hodgepodge of Girl, Interrupted and The Ward, with One Flew Over the Cuckoo's Nest and Natural Born Killers as distant inspirations, uncertain of its direction and oblivious to its desired scope. Eventually, the material juxtaposes calmness between the stable inmates with "loonies running the loony bin" chaos that's driven by limp, confused violence and little enthralling significance, not knowing how to properly punctuate the attention-grabbing, exaggerated entities maneuvering around Allen. On the Inside simply feels ... off, like a network of red herrings, stylistically-composed visual cues, and emblematic pathways that lead to the end of a cerebral psychodramatic maze which, really, isn't much of a brain-challenging exit point. Several elements possess an air of implausibility and suspicion that dampen its authenticity, from the Northwood staff's unexplainably strange behavior and The Ward's laid-back screening processes to the uncanny ways that Allen interacts with the other inmates. They read like suggestive pokes-'n-prods to make viewers contemplate what they're seeing, as if figurative layers are meant to be peeled back, and the outline of a stimulating viewpoint could be seen in the material D.W. Brown presents with an open mind. Like this, Brown's film lacks the convincing expressive tension and thematic point it needs around the story's shocking turns to justify its gritty psychological approach, one wanting to latch onto a statement about innocuous persons within institutions that doesn't materialize. Steely, stony blues and tans dominate On the Inside coarse high-contrast photography, which Anchor Bay locks down in a satisfying 1.78:1-framed, 1080p treatment that divvies out more than a few doses of capable institutional mood. It's grainy on purpose, and a real balancing act; shot on film by David Armstrong, the man responsible for photographing most of the Saw sequels, he knows how to obtain sharp detail in a thick, unsettling visual temper, while also achieving unique skin tones and bursts of restrained palette initiatives where needed. Anchor Bay's Blu-ray hits the nail mostly on the head: the grain retains a natural heaviness, only appearing digital and filtered on a few occasions, while the low-saturation skin tones, sterile walls, and grayish-tan uniforms reveal a capable eye for color fluctuations and occasional fine details in textiles and close-ups. Barring a few blandly-detailed sequences and a few expressions of wishy-washy contrast and heavy grain, On the Inside is a convincing HD tumble through a psych ward. Assertive video needs assertive audio to match it, and Anchor Bay gets their hands dirty with a fierce, frequently active Dolby TrueHD 5.1 track. A lot of On the Inside's momentum is fueled directly by Haim Mazar's heavy musical propulsion, which the HD audio track presents loud, dominant, and extremely well-balanced across the full sprawl of the sound-stage. Typical of a thriller set inside a prison-like environment, you'll get a lot of doors and bodies slammed, which the lower-frequency and mid-range quadrants break out with a stiff punch where needed. And while conversations rarely get to a point where it's low or intimate, the dialogue balance -- from deep baritones to Olivia Wilde's warm registry -- stay centered in their respective channels with involving awareness of the surround environment. Rarely a quiet moment exists in the film, and Anchor Bay's up to the job in keeping it moving forward. English SDH and Spanish subs are available. 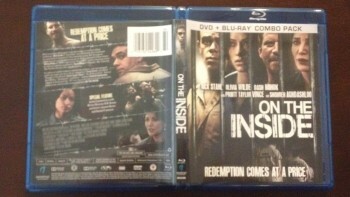 On the Inside arrives with only one supplements: an Audio Commentary with Director D.W. Brown and Actors Joanne Baron and Daniel Franzese. 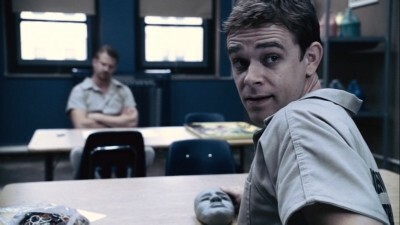 It's a casual conversation with the cast and crew, where they point out actors, discuss motivations, and discuss a few of the production's details, such as the authenticity of the psych ward garb and the experiential ways that they all prepared for working on a film about a mental institution. Their discussion veers towards a few unusual topics, such as working with Olivia Wilde before she became a star, the connection this film shares with ER and actor Noah Wyle, and director D.W. Brown's personal feelings about the pointlessness of auditions. It's not a terribly gripping track, but you'll get a few neat bits out of it. A DVD copy of the film takes up the space for the Disc Two, which does include the commentary. On the Inside seemed like it might be right up my alley; from its focus on psychological imbalance to its usage of Nick Stahl and Olivia Wilde in challenging material, the premise of an institutionalized man dealing with his inner mental and emotional demons could've been sharply realized here. D.W. Brown's psychodrama ends up being something else, though: a decidedly less engaging and reasoned slab of stony institutional suspense, offering off-and-on respectable performances in a tumultuous, fairly unrewarding thriller that doesn't go very far within its conceptual parameters. There's some good to be found in Stahl and Wilde's locked-in performances (especially from Wilde, who could easily handle this type of material again), but they're constantly fighting against a somewhat stagnant script full of old-hat ideas and an inert purpose. Anchor Bay's Blu-ray does an exceptional job of presenting the film though, and should make the Rental worth the time for the meager intensity that Brown's direction of the actors achieves.